Dry “pit-r-ick.” Hoarse Robin-like song with short fluty phrases given with a pause in between. 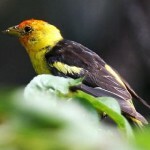 Description: Breeding male has bright red head; black back, wings, and tail; bright yellow underparts and rump; first wing bar is bright yellow, second is pale yellow or whitish. 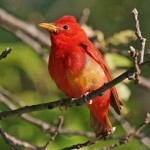 Male’s red head becomes yellowish and finely streaked in winter. Female has grayish back that contrasts with greenish-yellow head and rump; yellowish below; thin wing bars that are similar to male. 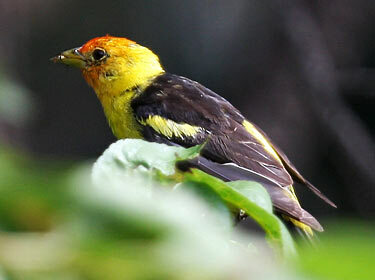 Behavior: Feeds on insects like a flycatcher, often from the high canopy. 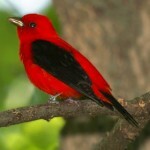 Habitat: Mainly found in pine forests. Sometimes seen in deciduous forests along rivers or in gulches and canyons. Where in Nebraska: Uncommon spring and fall migrant in western Nebraska. Summer resident in Pine Ridge area. Fun Facts: The red on the face of the Western Tanager is not a color manufactured by the bird but rather acquired through its diet of insects.